We didn't get to see the summit of Mt. McKinley. It is way, way up there above the clouds. On a clear day this is a good spot for viewing it. The higher of those two peaks, Mount Silverthrone in the center of the picture, is 13,220 feet. Judging by that, there is roughly 7000 feet of Mount McKinley above the clouds. This shot was taken looking southwest from Stony Hill, about 30 miles from McKinley's summit. Most of the peaks in the area surrounding McKinley range from 9000 to 14,000 feet. 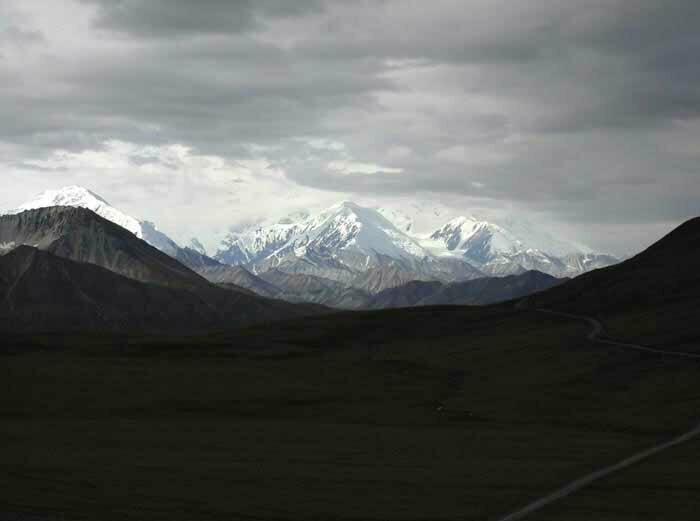 Only Mount Foraker (17,400 ft.) further southwest, approaches the height of 20,320 foot Mt. McKinley.